3. Lavish pictures for inspiration. Whether it is for a birthday, a holiday, a wedding, an anniversary or an event, you will find countless ideas to make your parties successful throughout the year. Parties and celebrations are moments to share and a way to celebrate life’s moments. A party for whatever reason is an emotional moment. Ideally, our five senses should be pleased in a party or celebration. Organizing the ideal party is a dream for everyone and an objective for many of us. Whatever our culture, with whoever we share it, a good party should be a memorable moment for everyone. 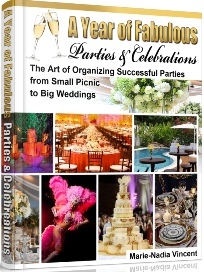 With “A Year of Fabulous Party and Celebrations”, my objective is to inspire you to celebrate life surrounded by families, friends, colleagues, contacts, … This book intend to be a reference that you can use along with your imagination and your creativity to create your own fabulous parties.